Dental care is a life-or-death matter on La Gonave. 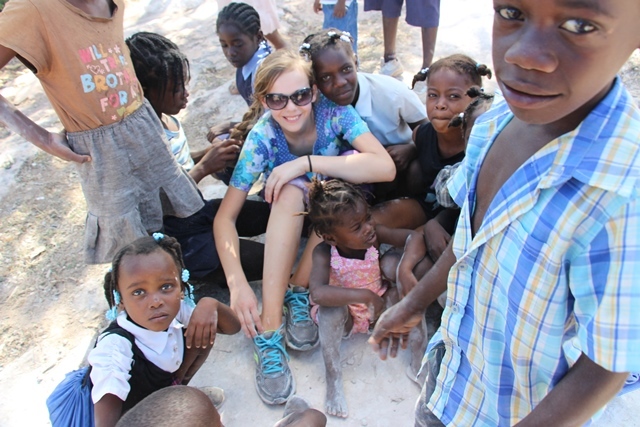 Haiti (MNN) — Dental care is a life-or-death matter in the third-world nation of Haiti, especially on the island of La Gonave. This is Dr. Dan Gordon’s third year of providing dental care in partnership with Starfysh. What began as short-term service at Anse-de-Galet’s WISH facility has morphed into an annual mobile dental clinic in the mountain village of Makochon. “Because there’s no dentist on the island, issues with tooth decay and gum disease run rampant–to the point where major infections [set in] and [there are] a lot of teeth that need to be pulled,” says Gordon. Sometime between last year’s mobile clinic and the team’s arrival last week, a small child died of a tooth infection. 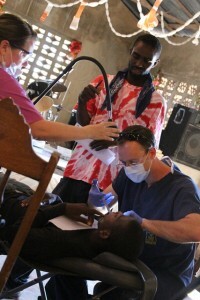 Dr. Gordon works on a patient at the Makochon mobile dental clinic. Today, Gordon, the Bauer team, and a Haitian dentist from Port-au-Prince are wrapping up a three-day mobile dental clinic. They’ve cared for over a hundred patients. 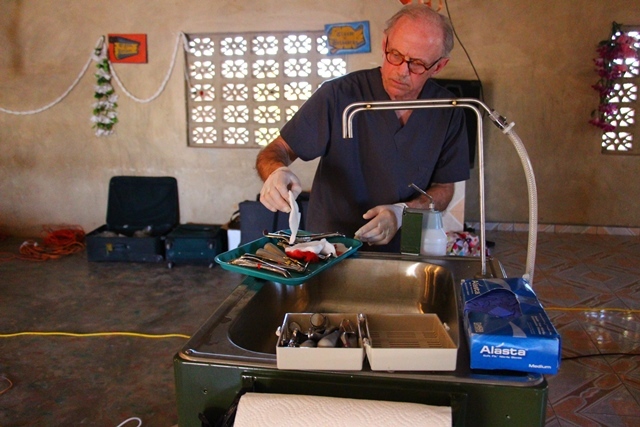 “Since becoming a dentist, I wanted to use my skills to be the hands of Christ,” states Gordon. 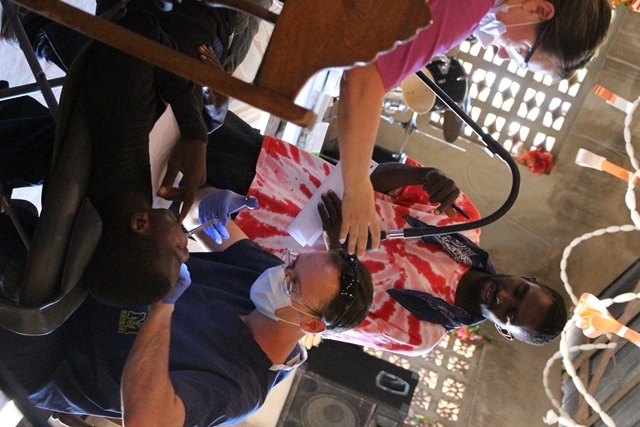 Serving at the dentists’ sides are Dr. Gordon’s assistant, Kammy, and a pair of Haitian translators, Wesley and DeDe. Members of the Bauer short-term missions team rotate between equipment sanitation and outdoor ministry. The team prays for each patient and offer comfort when patients are scared. Most of each day’s dental patients bring their children to the Makochon church, where the mobile clinic is set up. When members of the Bauer team aren’t sanitizing equipment, they’re learning the names of those waiting for care, holding babies and playing games with the Haitian children. When members of the Bauer team aren’t sanitizing equipment, they’re learning the names of those waiting for care, holding babies, and playing games with the Haitian children. While it may seem the Bauer team and Starfysh are only meeting physical needs, their visit resounds on a deeper level, too. Pastor Joppie leads the Makochon church and works regularly with Starfysh. 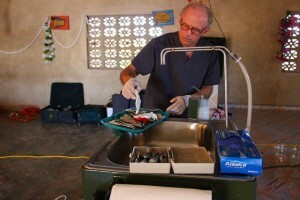 He explains to people who come for dental care that the team does this as an extension of Christ’s love. Starfysh hopes to expand this ministry beyond Makochon. 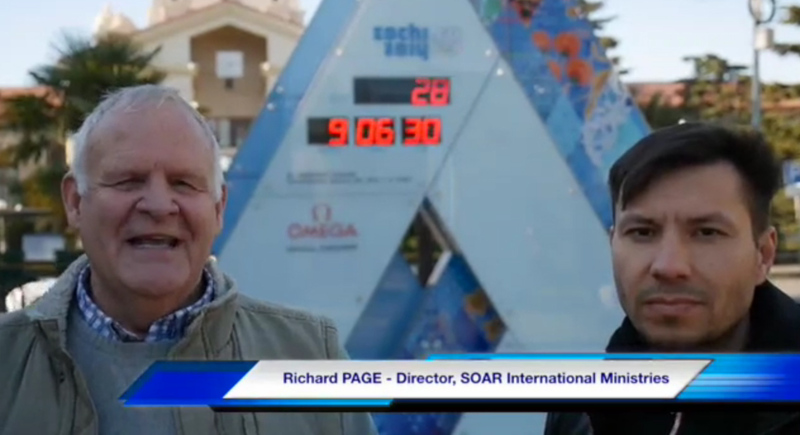 “The vision is to take these mobile clinics–both dental and a medical piece–into remote villages where people have very limited or no access,” says Gordon. 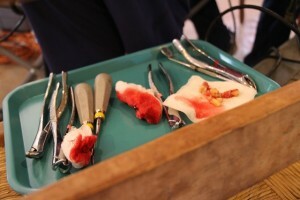 Dental equipment donated by Gordon’s office is a big step toward making the vision a reality. Members of the Bauer short-term missions team rotate between equipment sanitation and outdoor ministry. “It only does good if it’s being used, so the more it can be used, the happier myself and Dr. Edmondson will be,” Gordon states. Interested in using your medical or dental skills as an expression of Christ’s love? Contact Starfysh here. Pray for patients who don’t know Jesus to come to know Him as Savior through this tangible expression of love. Pray that relationships between returning team members and Makochon villagers will be deepened by this year’s visit. Great information and pray many more will come to serve & share the love of Christ through their God given gifts of dentistry! Thanks Katey for the awesome report! Two years ago our church bought a big school bus. Took all the seats out…scrapped and painted inside and out white…and put in two complete dental chairs..air conditioning..tinted all windows..big elec. generator on the rear…all wired and ready to go to Haiti BUT…we can’t sent it there because of PAPER WORK. Anyone out there have any suggestions? We have the money…no problem there. Try contacting Steve Edmonson through starfysh.org (through the contact us link) He may be able to help you. One thing is for sure, such a bus would get lots of great use in Haiti. Pray for patients who don't know Jesus to come to know Him as Savior through this tangible expression of love. Pray that relationships between returning team members and Mare Cochin villagers will be deepened by this year's visit.